It might be useful to quote Rothbard in depth on the “myth of the ‘great depression’ of the 1870s. Orthodox economic historians have long complained about the “great depression” that is supposed to have struck the United States in the panic of 1873 and lasted for an unprecedented six years, until 1879. Much of the stagnation is supposed to have been caused by a monetary contraction leading to the resumption of specie payments in 1879. Yet what sort of “depression” is it which saw an extraordinarily large expansion of industry, of railroads, of physical output, of net national product, or real per capita income [emphasis mine]? As Friedman and Schwartz admit, the decade from 1869 to 1879 saw a 3-percent per-annum increase in money national product, an outstanding real national product growth of 6.8 percent per year in this period, and a phenomenal rise of 4.5 percent per year in real product per capita. It should be clear, then, that the “great depression” of the 1870s is merely a myth – a myth brought about by misinterpretation of the fact that prices in general fell sharply during the entire period. Indeed they fell from the end of the Civil War until 1879. … Unfortunately most historians and economists are conditioned to believe that steadily fall prices must [emphasis original] result in depression: hence amazement at the obvious prosperity and economic growth during this era. The Long Depression was a worldwide economic recession, that began in 1873 and ended around 1896. It was the most severe in Europe and the United States, which had been experiencing strong economic growth fueled by the Second Industrial Revolution in the decade following the American Civil War. At the time, the episode was labeled the Great Depression and held that designation until the Great Depression of the 1930s. Though a period of general deflation and low growth, it did not have the severe economic retrogression of the Great Depression. The American Civil War was followed by a boom in railroad construction. 33,000 miles (53,000 km) of new track were laid across the country between 1868 and 1873. Much of the craze in railroad investment was driven by government land grants and subsidies to the railroads. At that time, the railroad industry was the nation’s largest employer outside of agriculture, and it involved large amounts of money and risk. A large infusion of cash from speculators caused abnormal growth in the industry as well as overbuilding of docks, factories and ancillary facilities. At the same time, too much capital was involved in projects offering no immediate or early returns. The last paragraph above is very “Austrian”, in the sense that it states that capital had been misallocated during the “railroad bubble”. But Rothbard is right. There was no contraction, despite all the “malinvestment”. The Panic of 1893 was a serious economic depression in the United States that began in 1893. Similar to the Panic of 1873, this panic was marked by the collapse of railroad overbuilding and shaky railroad financing which set off a series of bank failures. Compounding market overbuilding and the railroad bubble, was a run on the gold supply. The Panic of ’93 was the worst economic depression the United States ever experienced. Another Austrian tale. But this time there really was a strong economic contraction. Then there´s the “Great Depression” following the excesses of the 1920s and the ‘Panic of 2008’, a consequence of the “housing bubble” and all the “misallocation” that accompanied it. The panel below shows nominal and real spending during the different ‘panics’. As the title of this post suggests, one was a ‘nonevent’. And that´s the so-called ‘Panic of 1873’. And why is it a nonevent despite all historical accounts? 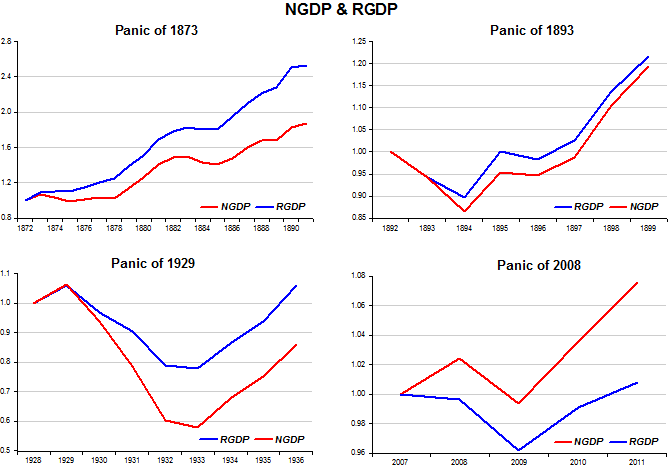 Just look at the behavior of nominal spending through the different ‘panics’ and note that the only occasion in which nominal spending didn´t crash was in the ‘Panic of 1873’. I don´t know why Austrians decry the 1873 contraction a myth. From their perspective they should be searching for reasons why it didn´t happen despite all the malinvestments that, according to them, are a root cause of all the other ‘Panics’. In 1873 and in 1893 there was no Central Bank. In 1929 and 2008 the Fed was there to minimize the effects of such ‘panics’. Apparently, Central Bank or not, it surely doesn´t help to let nominal spending crash! And Bernanke should note that in the 1870s and 1880s the economy performed robustly in spite of a drawn out fall in prices, an ingredient of his worst nightmares! I won´t mention Greece. It´s the Eurozone “free-rider” par excellence and will likely only leave the euro if expelled! Let´s take a more representative agent, Spain, whose people are beginning to consider “life outside the zone”. Why´s that? 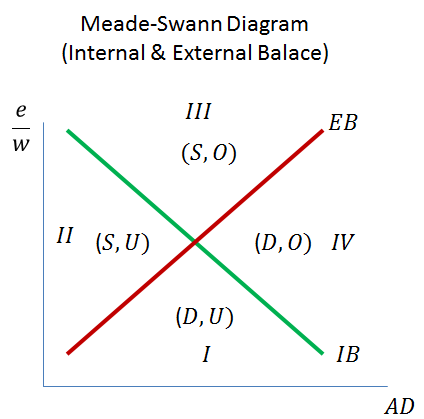 The problem is best illustrated with the so called Meade-Swann diagram representing the internal and external balance conditions of a country. The figure illustrates. On the vertical axis we have a measure of the real exchange rate, here defined as the ratio of the nominal exchange rate to the wage. In the case of Spain, being in the euro, there´s no way it can independently change the nominal exchange rate. The real exchange rate indicator used can be interpreted as a measure of the Spain´s “competitiveness” relative to, say, Germany. The horizontal axis measures aggregate demand (absorption). The Internal Balance (IB) line represents points such that the combination of the real exchange rate and absorption are consistent with a measure of IB, here defined as unemployment at the “natural” rate. The External Balance (EB) line represents points such that the combination of real exchange rate and absorption are consistent with a measure of EB, here defined as a “balanced” current account (CA). The figure is divided in four quadrants. Quadrant I depicts a situation where the country is running a current account deficit (D) and unemployment is above the “natural” rate (U). Quadrant III represents a situation of CA surplus (S) and “overheated” economy (O), one in which unemployment is below the “natural” rate, and so forth for the other quadrants. Spain is clearly deep inside quadrant I, running a CA deficit and with high unemployment. Let´s put Germany in quadrant III, running a CA surplus and with unemployment close to the “natural” rate. 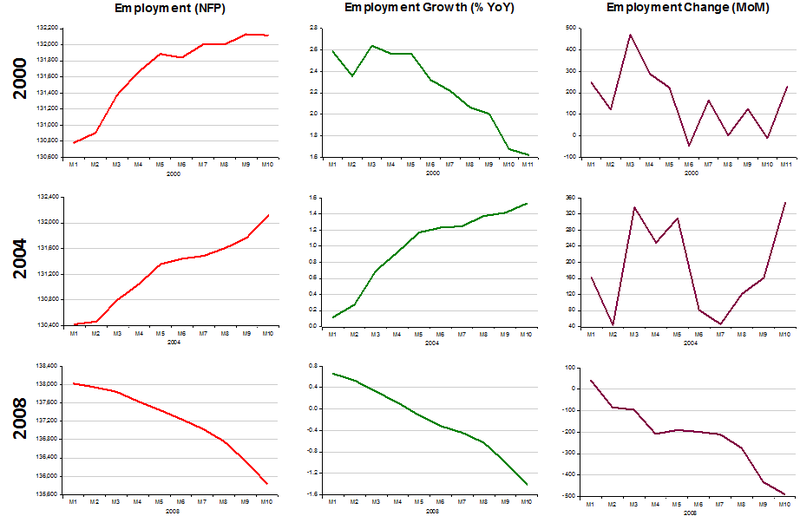 The charts illustrate the CA and unemployment situation in both Germany and Spain. Notice that since the crisis began, Spain has reduced its CA deficit somewhat. In terms of the Meade-Swann diagram above, it has moved closer to the EB line, at the same time distancing itself from the IB line, i.e. unemployment has risen. Germany has made no move to reduce its CA surplus. Germany´s position is “comfortable”, that being the reason it wants Spain (our “representative agent” for the “periphery”) to practice “austerity”. That means putting onto Spain´s shoulder the whole burden of adjustment. Spain can acquiesce and tolerate high (and rising) unemployment for many more years, until wages are pushed down and prices are reduced. To many, Spain could also take measures to reduce costs through structural reforms and the improvement of infrastructure. But that takes an even longer time and there´s little chance that Spain could get the financing for infrastructure improvements. And I´m not even considering the political implications of “austerity”. Germany (as representative of the “core”) could give a helping hand by taking steps to reverse the policies that led to the crisis. They can cut taxes in order to reduce domestic savings and increase domestic consumption. These measures would amount to an interval appreciation, raising wages and prices relative to Spain, thereby increasing Spain´s competitiveness and reducing its CA deficit for any given amount of “austerity”. But Ms Merkel is the “nein, nein, nein” lady and people like Bundesbank President Jens Weideman would go crazy with the idea. To them what´s needed is more “austerity”! To top it all, even if there are moves to increase the relative competitiveness of Spain, at the end of the day there will have to be measures to deal with the real increase in Spain´s domestic debt burden. That will arise both if Germany decides to help and “inflates” relative to Spain, which will force up euro interest rates, increasing Spain´s refinancing costs, or if Spain deflates, directly increasing the real debt burden. And how do countries faced with that problem act? They confiscate domestic savings! At the end of the day, it is very unlikely that Spanish voters will accept high unemployment and an assault of middle class savings for as far as the eye can see without rebelling at the polls. Germany should come to its senses and realize that Spain simply cannot accept the full burden of adjustment. Obviously the third option for Spain would be to leave the euro, reintroduce the peseta and devalue. But that´s another story. From Tyler Cowen: It probably is about time to judge the euro zone as a failed idea — and rarely is it wise to double down on failed ideas. From David Zervos (quoted by John Mauldin): A bank run is the only way to get to equilibrium in this system. The chart shows nominal spending and output growth from 1800 to 2011. Important periods are highlighted. Twice in the last century, economic turmoil revealed the failure of a monetary regime and forced the West to abandon it for another. During the Great Depression of the 1930s one country after another abandoned the gold standard — a decision vindicated when they recovered in the same order. The inflation of the late 1960s and 1970s, meanwhile, persuaded most of the developed world’s central bankers to quit trying to “fine-tune” the real growth rate of the economy and instead concentrate on achieving price stability. Will voters still have a GROWTH bias in the coming election or will LEVELS hurt? If you looked only at how strong the economy was in 2000 and 2004, the elections would surprise you. If you looked at the growth rate, however, the outcomes look unsurprising. Voters, it seems, have short memories. Nothing appears to have a bigger influence on presidential elections than the pace of economic growth in the year leading up to the election. Keep that in mind when you hear simple comparisons about no president having won re-election when the unemployment rate was above a certain level. Ronald Reagan easily won re-election with the rate above 7 percent. Mr. Gore lost with the rate below 4 percent. When Al Gore went before voters in November 2000, as a sitting vice president promising to continue President Bill Clinton’s economic policies, the economy was in excellent shape. The unemployment rate had fallen to only 3.9 percent, and middle-class incomes were growing at their fastest clip in a generation. Yet over the course of the 2000 campaign, the economy also slowed markedly. Monthly job growth at the start of the year was almost 300,000; by November, it was only about 100,000. If Mr. Gore had the benefit of an economy functioning at a very high level, he did not have the benefit of one growing at a rapid rate. Four years later, when President George W. Bush was running for re-election, the economy was in far worse shape than it had been in 2000. The unemployment rate was roughly 5.5 percent in late 2004 and would have been higher if so many people hadn’t dropped out of the labor force, neither working nor looking for work. But the economy was also beginning to improve and to escape the jobless recovery of 2002 and 2003. Even if the level of economic activity in 2004 was vastly different from the level in 2000, the rate of growth in the two years was quite similar. In the 12 months ending in November 2000, according to the Labor Department’s survey of employers, nationwide employment grew by 1.6 percent. In the 12 months ending in November 2004, it grew by an identical 1.6 percent. In the months immediately before the two elections, job growth was actually stronger in 2004 than 2000, helping Mr. Bush to win re-election narrowly. Let´s picture this and also include the election year 2008. Leonhardt´s arguments seem right. For example, in 2000 employment level was high but employment growth was falling and the monthly change in employment was weak. In 2004 the level of employment at election time was about the same as at election time in 2000 (but note that population and labor force had grown in the interim period), employment growth was the same as in 2000 but rising, while the monthly change in employment was rising and much more robust than in 2000. 2008 is a “no brainer”. All measures were fast coming down and growth rates were negative. What do we have so far in the last 12 months going into the 2012 election? The level of employment now is still about 3.5 million short of what it was when Obama was elected. The growth in employment is weak and falling while the change in employment is quite low and falling fast. This could change in the five months before the election. But they would have to change by unrealistic amounts in order for the “level pain” to be anesthetized by “growth”. Bottom Line: The data flow is soft, but Dudley indicates it is not soft enough to ease. And while some are pointing to falling TIPS-derived inflation as given the Fed room to move, they have traditionally delayed until conditions are direr (they are not exactly prone to overshooting in the first place). The Fed doesn’t think they will ease further; they think their next move will be to tighten. Which means that financial conditions will need to deteriorate dramatically to prompt action in June. So if you are looking for the Fed to ease in just four weeks, you are looking for financial markets to turn very, very ugly. Lehman ugly. And I wish that I could say that it won’t happen, but European policymakers are hell-bent to push their economies to the wall while worshipping at the alter of moral hazard. Fed Official says: The problem is structural. There´s not much monetary policy can do to help revive the economy. That if the Fed Funds rate was kept at zero the appearance of deflation was only a question of time! The operative word is IF, and two years on we know the economy has not rebounded – climbed out of the hole into which it dropped after mid-2008. MINNEAPOLIS (Reuters) – Unemployment may not have too much farther to fall before inflation threatens, forcing the U.S. Federal Reserve to respond by raising interest rates sooner than expected, a top Fed official said on Thursday. The U.S. central bank’s monetary policy “should be responsive to such signals,” he said. At least he dropped his “low interest rate-spells-deflation” sequence. And his “it´s structural” follows from his reading of the Beveridge Curve, a creation of Lord William Beveridge who wrote the Beveridge Report of 1942 which paved the way for the development of the British welfare state. The Curve establishes a negative relation between the rate of job openings and unemployment, grounded on idea that if the unemployment rate is elevated firms would find it easier to fill vacancies. If that doesn´t happen, it means that the curve is shifting up, indicating that firms have greater difficulty in filling vacancies. This could be due to several factors, among them greater difficulty in matching workers to jobs and the persistence of long-term unemployment (which may “depreciate” human capital and/or increase “negative perceptions” about the unemployed by potential employers). The “mismatch” view is difficult to reconcile with the observation that, with the notable exception of the Leisure & Hospitality sector, employment most everywhere is still way below the pre-recession peak, even though we´re almost three year into the “recovery”. And in no sector are wages differentially rising to indicate that labor demand outstrips supply. Maybe the high rate of long term unemployment is the main factor behind the Beveridge Curve dynamics. Pity that the JOLTS data only begins in late 2000, so we cannot compare present behavior with that observed, for example, in the deep recession of 1981-82. The point is that there are always “structural” elements present in the unemployment rate observed. After all, the economy is permanently in motion and all sorts of “frictions” are present. But I believe that for most situations the strength of aggregate demand will help in the adjustment process, so I´m willing to bet that in the early eighties we would not be discussing, like now, about the “structural” nature of unemployment. 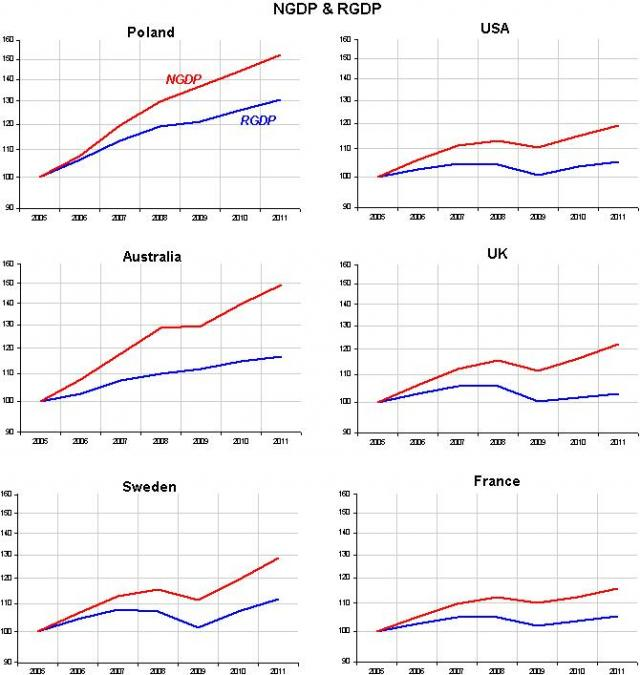 While between 1982 and 1985 aggregate demand grew on average 10.6%, since 2008 it has only expanded at 2.9%, barely more than half the 5.6% growth observed during the twenty years of “Great Moderation” (1987-07). So, while in the early eighties long term unemployment averaged 18.7 between 1982 and 1985, it has averaged 35.1% since 2008, having remained above 40% for the last 28 months. Labor market outcomes do remain notably worse than prior to the recession. The good news is that the unemployment rate has been declining since the end of the recession. But there is also countervailing evidence: The labor force participation rate has been falling steadily, and the employment/population ratio remains near its low point. 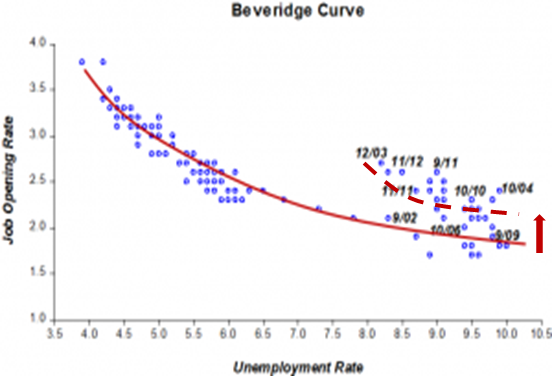 The Beveridge curve shows considerable deterioration in labor market matching efficiency. But he fails to make the connection between the magnitude of the crisis and monetary policy. 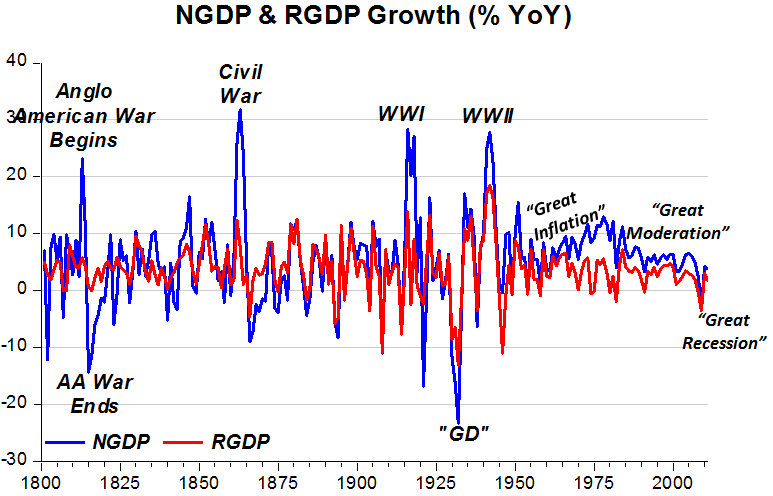 This connection comes out very clearly in the chart below which shows that for the first time since 1937/38, during the second leg of the Great Depression, nominal spending (NGDP) growth – a magnitude directly determined by the Fed – turned negative, and significantly so! But there is another, more troubling possibility: the crisis may have permanently dented America’s productive capacity. If so, the “output gap” between the economy’s current level of production and its potential level is much smaller than expected. Unemployment has fallen because there are fewer people available to work. Inflation is stable because there is less idle capacity to restrain prices. This would be bad news all round. America would be permanently poorer than would otherwise have been the case. The Federal Reserve would have less room to ease policy before inflation revives. More of the budget deficit would be structural, rather than the temporary result of a depressed economy. As Adele sang: Let´s keep “Rolling in the deep”. To many, there´s now basically nothing monetary policy can do to help the economy come out of the deep hole that bad monetary policy pushed it into! Lights quickly fading in Brazil! A few weeks ago I wrote a post called “Why Brazil doesn´t grow”. 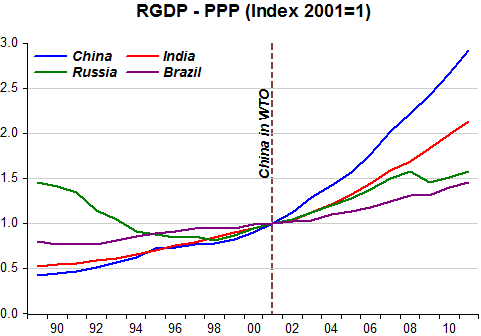 Note that I didn´t ask why Brazil´s growth is dimming. I thought the lights had not been bright for some decades. Two recent articles deal with Brazil. One is pessimistic, the other tries to put a positive spin. The “positive spin” is provided by the well-known brazilianist Albert Fishlow who writes “Down but not out” in the latest issue of Foreign Policy. The pessimistic view is provided by Ruchir Sharma in “Bearish on Brazil” in the latest issue of Foreign Affairs. In Fishlow´s take there´s a lot of wishful thinking, and I believe Sharma´s view is more realistic. That´s just one more manifestation of the age-old saying that Brazil is “the country of the future” – or “would-be giant”. But as we well know, the future is, well, always in the future! Funny to realize that in the BRIC acronym B(razil) takes “front seat”. In real life it takes the “back seat”. To reflect reality, the acronym should read CIRB! China is in the “driver´s seat”. Unfortunately China´s “pull” over the last decade, since it became a member of the WTO, had only a marginal effect on Brazil. Even so, a marginal effect can make people optimistic if incomes rise a bit after two decades of stagnation. But as China “shifts down” even that marginal effect will fade. The chart provides a good illustration. 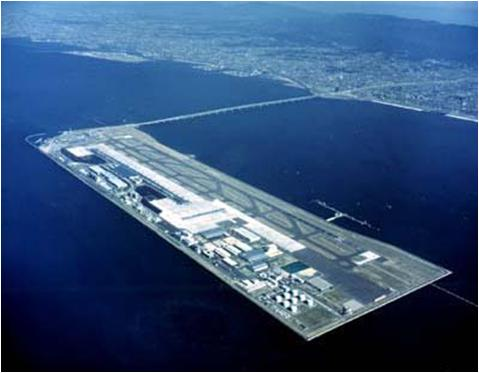 In version I there was an airport over water in Japan, courtesy of fiscal stimulus. 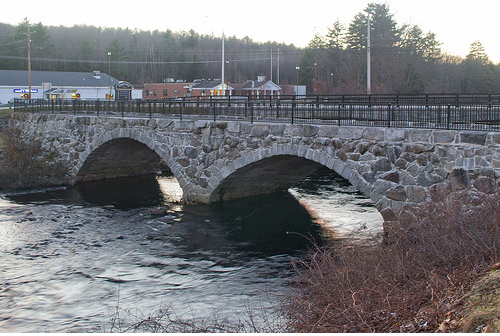 Fiscal stimulus now has brought you the renovation of a “Bridge to nowhere” in New Hampshire! There are certainly many more examples of “fiscal stimulus efficiency” out there. “Captain” Krugman auto proclaims himself a “dangerous voice” and wonders if he will be barred from entering the UK! Aha. I’m a “dangerous voice” for criticizing UK austerity policies, not to mention one of “those who”. Other dangerous voices include Martin Wolf, who is getting shriller than I’ve ever heard him (and rightly so), Jonathan Portes (who has been doing yeoman work), and Simon Wren-Lewis, who is getting remarkably cynical. So will I be allowed to enter the UK later this month to keep saying dangerous things? Of course, the reason us dangerous voices are so dangerous is that we’re right and are being proved right with each passing month’s experience. And it’s correspondingly becoming clear that Britain’s unnecessary turn to premature austerity is becoming a historic policy and political disaster that will haunt the country for years. So let’s see, how do we get austerity and stimulus at the same time? How about easy money and deficit spending? No, that won’t work. Tight money and budget surpluses? No. Tight money and big deficits? Hell no, that’s what we’ve been doing. That’s how we got into this mess. How about easy money and budget surpluses? Bingo. That’s a growing NGDP and budget surpluses—the Swedish way. Glad to see Cameron/Obama/”European leaders”/Hollande/Barroso have finally seen the light. Now do it. I parsed this “debate” a little while back. A reprise is in order. The first panel shows that the countries that avoided letting nominal spending (NGDP) drop significantly or at all are the ones where real output (RGDP) was least affected. 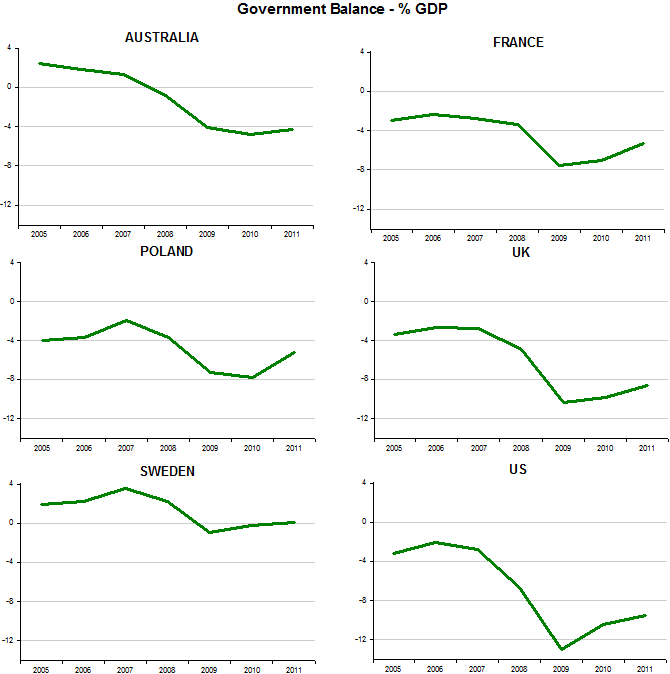 The panel below indicates that the same countries that did better monetary “stimulus” i.e. did not let NGDP tank are also the ones that have the lowest budget deficits. The high budget deficit group has low NGDP growth and weak RGDP recovery. So maybe Krugman is not a “dangerous voice” but simply, and contrary to what he perceives, a “wrong voice”! That “something” is “Inflation Targeting”. The “someone” is Harvard´s Jeffrey Frankel and the “someone else” is the Atlanta Fed Research Director David Altig. Taylor rule appears to represent reasonable policy and indeed, two mistakes are evident by comparing the dotted and solid lines in figure 9. Policy was easier than the rule during the late 1960s and 1970s and tighter than the rule in the first half of the 1980s. But if policy is to be evaluated based on information that was actually available when policy decisions were made, a different conclusion emerges. This is evident by comparing the dashed and solid lines in figure 9. If anything, the policy mistake of the late 1960s and 1970s is that actual monetary policy followed the Taylor rule, too closely! Rather than follow the Taylor rule, policy should have been considerably tighter. Given the mistake of following the Taylor rule in the 1970s, the deviation from the Taylor rule in the early 1980s and the policy tightening associated with the Volcker disinﬂation was an appropriate response to the inﬂation problem created by following the rule. Volcker followed a policy of strict control of the money supply, as opposed to control of the interest rate. This policy rapidly reduced inflation at the cost of a period of high interest rates and a big spike in unemployment. In 1983, Volcker returned to a policy of interest rate control, but the implementation of that policy changed. After 1983, the inflation-reaction coefficient increased; the Fed raised the short-rate by a larger percentage in response to inflation than it had done in the period from 1951 through 1979. The result was a period of remarkable stability in which inflation and unemployment fell, and inflation, growth, and unemployment all became less volatile. 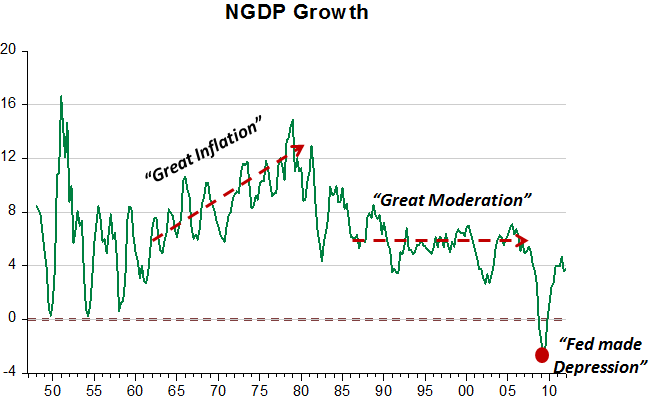 Because of increased stability in inflation, unemployment and GDP growth that occurred after 1983, this period has been called the Great Moderation. In my view, the monetary policy rule that was followed from 1983 through 2006 was directly responsible for the Great Moderation. It seems the two statements are contradictory. In fact, Roger Farmer´s statement is consistent with the “consensus view”, held, among others, by John Taylor (for obvious reasons) and Bernanke himself. 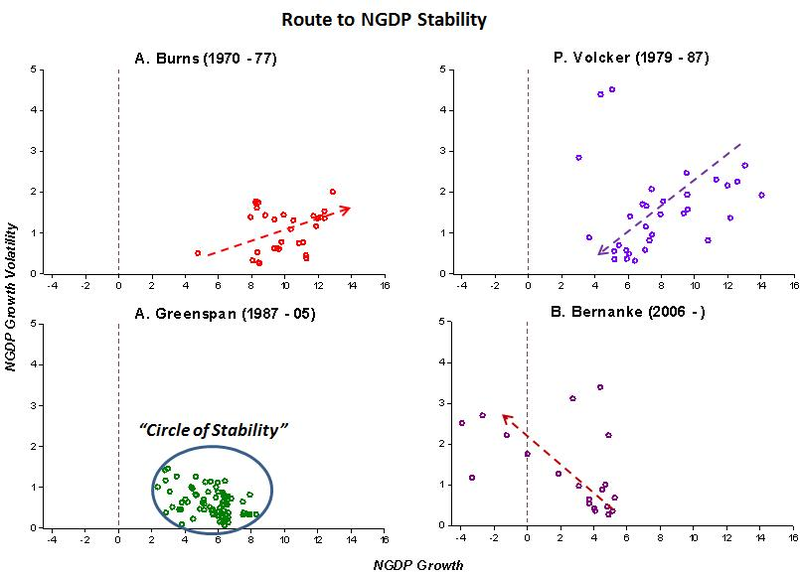 Summarizing: In “the change in monetary policy is responsible for the great moderation” hypothesis many, among them Taylor and Bernanke, have attributed this “feature” to the fact that monetary policy following the appointment of Paul Volker to the Fed is characterized by an increased responsiveness of monetary policy (interest rate targeting) to inflation. This means that from the perspective of a Taylor Rule, which relates the Fed Funds (FF) rate to the difference between inflation and its “target” and the “output gap”, the coefficient on inflation has increased and was set above 1 following Volker. As always, in economics conclusions are not definitive. So it is that research by Orphanides calls into question the shift in how monetary policy responds to inflation showing that, when using data available to policymakers in real time, monetary policy during the 1970´s was characterized by a rule that is consistent with the estimated rules for the period after Volker, i.e. 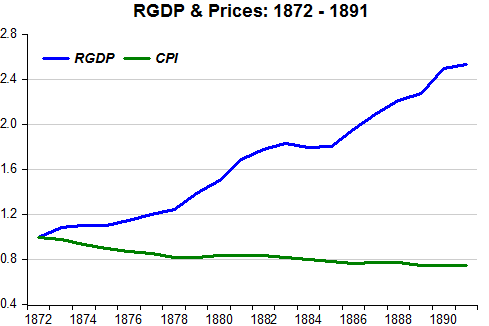 the coefficient on inflation was also greater than one in the period of the “Great Inflation”. Is there an alternative view that is able to reconcile hypotheses with data? An alternative view of the change in monetary policy from the Great Inflation to the Great Moderation is that there was a change in the “doctrine” of the Federal Reserve. According to Robert Hetzel, during the period of the Great Inflation, the prevailing view, and the one embraced by Arthur Burns, Fed chairman from 1970 to 1977, was that inflation was a real (cost-push), and therefore non-monetary, phenomenon. From that (Keynesian orthodoxy) perspective, the optimal combination of fiscal and monetary policy could deliver sustained real growth while “incomes policy” would be effective in containing inflation pressures that might arise! This view is clearly illustrated by Burns who argued as early as 1970 that “monetary and fiscal tools are inadequate for dealing sources of inflation such as are plaguing us now – that is, pressure on costs arising from excessive wage increases”. Later, in different situations, he would alternatively blame, in addition to union power, oligopolists for keeping prices high and Arabs for jacking up the price of oil. Since each of these shocks could be viewed as real (cost-push) shocks, Burns denied any role for the Federal Reserve in generating inflation and repeatedly argued against a tighter monetary policy! When placed in the dynamic Aggregate Supply (AS)/Aggregate Demand (AD) framework, this “cost-push view” as advocated by policymakers in the 1970´s suggests that the short-run AS (SAS) curve was perceived as horizontal when output is below potential. The implication of this perceived characteristic of the SAS curve is that negative supply shocks would drive inflation higher and output lower. Given the horizontal shape of the SAS, monetary policy could successfully increase AD without generating additional inflationary pressures. On the contrary, as Arthur Burns argued following the 1973 oil shock, “a markedly more restrictive policy would have led to a still sharper rise in interest rates and risked a premature ending of the business expansion, without limiting to any significant degree this year’s upsurge in the price level”. This “cost-push” view of inflation, together with an SAS perceived as horizontal when output is below potential, can explain the observed differences in the estimates of the parameter on inflation in the Taylor Rule during the Great Inflation and the Great Moderation. Under the cost-push “doctrine” prevalent during the 1970´s, a forecast of inflation based on the short-run Phillips Curve (which negatively relates changes in inflation to the level of unemployment (the NAIRU – Non Accelerating Inflation Rate of Unemployment) or, positively relates changes in inflation to the output gap) would result in systematically under forecasts of inflation since after the negative supply shock output is below potential and unemployment above the NAIRU. The fact that inflation was systematically under forecast implies that estimates of the Federal Reserve reaction function as measured by the Taylor Rule using real time data that the Fed had a much stronger response to inflation than the response obtained using “final” data. So, if during the Great Inflation the Fed did not under react to inflation, given real time data – the error coming from a flawed forecasting mechanism – The Phillips Curve – how come the Great Moderation emerged? In other words, how did Fed “doctrine” change and why was this new “doctrine” consistent with reduced volatility in both inflation and real output growth? On becoming chairman of the Fed, Volker challenged the Keynesian orthodoxy which held that the high unemployment high inflation combination of the 1970´s demonstrated that inflation arose from cost-push and supply shocks – a situation dubbed “stagflation”. The main difference between the two “doctrines” is not the change in the Fed´s responsiveness to inflation as argued by Taylor, Bernanke or Farmer, but the changed responsiveness to aggregate demand or nominal income growth. A collateral effect of the change in “doctrine” shows up in the reduction and stabilization of inflation and decreased volatility in real output. 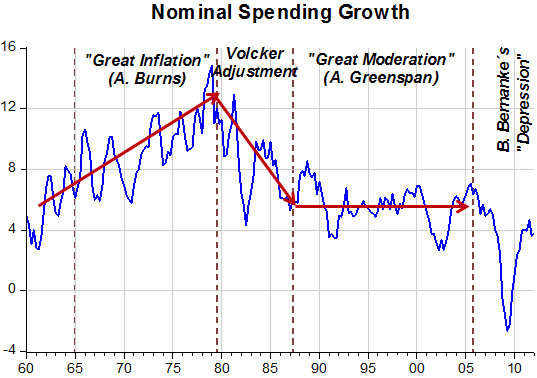 The Fed never explicitly targeted anything – inflation or nominal income (AD) growth – but implicitly you could say it targeted nominal AD along a 5.5% growth path growth after Volker. And the biggest victim of the “red herring” was Bernanke himself. Since forever he has been a great defender of the “IT modus operandi” and exactly when he put it in practice he got a “depression” as the result. Worse, not satisfied, he recently made the “corpse” official Fed policy! It is widely suspected, for example, that the reason for the European Central Bank’s otherwise puzzling decision to raise interest rates in July 2008, as the world was sliding into the worst recession since the 1930’s, was that oil prices were just then reaching an all-time high. Oil prices are given substantial weight in the CPI, so stabilizing the CPI when dollar-denominated oil prices go up requires euro appreciation vis-à-vis the dollar. One candidate to succeed IT as the preferred nominal monetary-policy anchor has lately received some enthusiastic support in the economic blogosphere: nominal GDP targeting. The idea is not new. It had been a candidate to succeed money-supply targeting in the 1980’s, since it did not share the latter’s vulnerability to so-called velocity shocks. Nominal GDP targeting was not adopted then, but now it is back. Its fans point out that, unlike IT, it would not cause excessive tightening in response to adverse supply shocks. Nominal GDP targeting stabilizes demand – the most that can be asked of monetary policy. An adverse supply shock is automatically divided equally between inflation and real GDP, which is pretty much what a central bank with discretion would do anyway.